Saturday’s edition of L’Equipe relaunched the idea of Antoine Griezmann signing for Barcelona. Their information likely came from a source on the player’s side, and it was claimed that both player and club are interested. The Atletico Madrid player was close to making the move last year, and dragged every single last bit of attention possible out of the situation. His documentary ‘The Decision’, in which Griezmann and his family were seen to struggle with the decision of him signing for Barcelona or not, probably didn’t go down as well as his ego hoped. That was all forgotten with France’s World Cup victory, but the Barcelona rumours rising again bring it all back. And, Barca fans aren’t ready to forgive and forget. 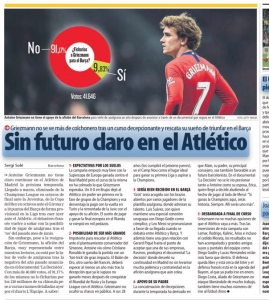 Sport say 91% of the supporters they polled over the weekend are against the idea of Barcelona signing the Atletico player in the next window. Mundo Deportivo got exactly the same 91% after doing their own poll and getting the opinion of 40,000 fans. The Catalan newspaper makes sure to say that they got that result despite presenting a list of reasons why the signing may be a beneficial one for Barcelona. What happened last summer, along with the player’s reported €120m cost, on top the huge wages he’s currently on and would expect at Barca, is going against the Frenchman.